I am able to make myself do the things that have to be done. And do the things that my soul craves as well. During the last weekend in January, Sandy and I got out and cleaned up the back yard and took the remaining tatters of the cloth roof off the gazebo, AKA the outdoor studio. The idea is to move it more toward the middle of the yard and away from the trees, and from there it will be mostly up to Sandy what he wants to do with it. I am not moving it or the many pavers that I put down when I set it up long ago. It nearly handicapped me then. But it was a great place to paint and make paper and read and journal until the trees behind starting dropping branches on it and the vines began ripping through the screened walls. A big limb came down on our back house a few weeks ago and so Sandy is cutting away at it and burning it. He is such a firebug. Saturday somebody told him that he looks like Captain Kangaroo. Between that weekend and this weekend we moved the greenhouse closer to the house where I think that it might get a little more morning sun. This will be a warm week and I will start some seeds. Last weekend Sandy took me to a country restaurant called Hillbilly Hide-a-way that we have been curious about for a long time. They bring you out some of everything that is on the menu that night and then you can order more of whatever you want, all you can eat. I guess if you are a huge eater it is a great deal. People wrote all over the walls for years so we added our names. It is a very popular place. I doubt we will go back though. On Thursday, we went to see Gaelic Storm at the Blind Tiger here in Greensboro. I saw them in 2016 and they put on a great show. I’m kind of surprised I didn’t write a post about it then because I took photos then. 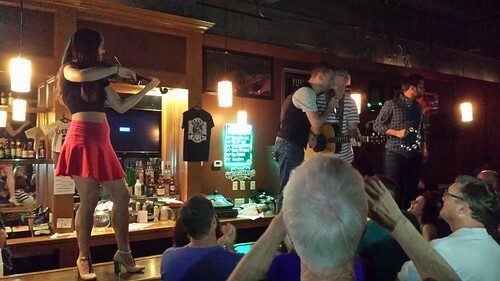 They have a new fiddler this year but here is a photo from last year when they ended the show up on the bar. Then on Saturday, I took a Tunisian crochet class at Gate City Yarns, and afterward we ate at Pier Oyster Bar and Grille, both in downtown Greensboro. This was our second time at Pier, and man, is it good. I had ahi poke tacos and the shells were crispy fried wontons. This is the first time I have found poke with the same flavorings that I found in Oregon in 2017. YUM. I really like Tunisian crochet. We have two more classes, and here is the start of the sampler…will post the final product later. I like the look of it and it is much easier on my right hand. As for Amanda and Gate City Yarns, I think that I have already proclaimed my love for Amanda here. I took the spinning wheel that belonged to Ida Eisemann to her. I had bought it in an antique store in Saratoga, Florida around 2002, I think. She was so beautiful that I could not leave it in the store. However, I felt strongly that she needs to go to a spinner so Amanda is going to look into getting her restored (she needs a flywheel) and either buy or sell her for me. She was lonely at my house. I believe this is an object with a soul. Yes, I am still weaving! I am making a mess of the hemstitching on the first curtain panel now. I made a similar comment a few days ago and lost it. don’t ask how. I almost never know!